The current debate on possible objects entails several problems. We focused on the issue of possible objects reality and sided for the possibilist position. As a matter of fact, we believe this position to be the best suited to classical metaphysical tradition. The classical possibilism we defend herein, though, has a realist foundation that is essentially different from Lewis’ concretist possibilism. It construes possible objects as possible non-existing objects of an existing producing power. Consequently, they are nothing vis-à-vis the modality of actual being of their own, though they are existing with regard to the modality of being of the producing power. The actualist requirement prescribed by the Frege-Quinean criterion of the quantification domain is thus fulfilled, therefore possible objects must not necessarily be actual objects. Hence the sense of coincidence between classical possibilism and actualist possibilism. Philosophical questioning often concerns matters which converge in a boundary area of various different, albeit complementary, ways. Literature, psycho-analysis and the cinema can represent, each in their own way, possible means of access for a Phenomenology of memory, in particular memory of fantasy. The path followed in this work derives its beginnings from Husserl’s phenomenology, to then investigate well-known literary, cinematic works and works of psycho-analytical reflection, from Borges to Hitchcock and to Freud, with the intention of penetrating into the problematic plexus of temporality/fantasy/memory. The essay intends to resume deliberation on the political dimension of illness and disability. The human person, when marred by fragility and vulnerability, is exposed to various forms of stigma, which become evident in crisis situations. The demand for social recognition and the introduction of various forms of classification, which should guarantee and extend the processes of inclusion and care, end up obscuring the very meaning and worth of the human person, diminished to capacities. The identity of the sick person, and the person with disabilities, remains problematic in the complex dialectics of mutual recognition given the absence of normativity regarding the person as otherness and irreducible subjectivity. 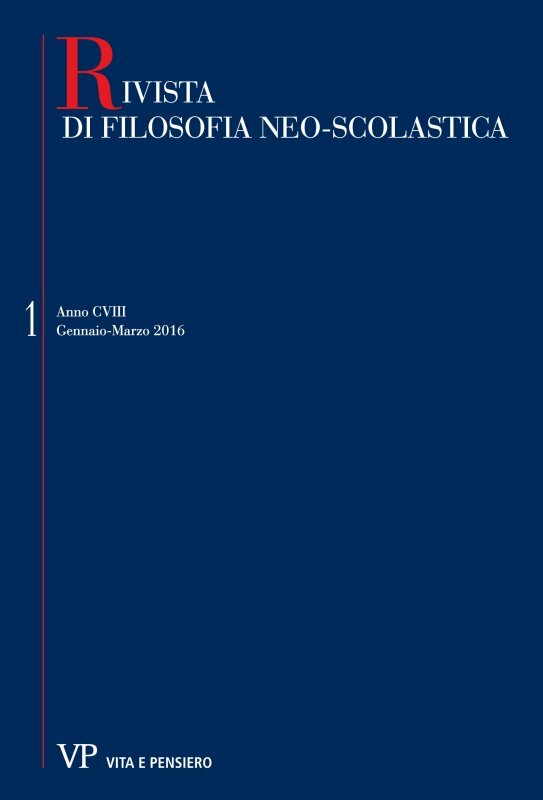 The edition of the question XXV on the first book of the Sentence commentary by Peter Ceffons of Clairvaux, contained in the previous number of the «Rivista», is now followed by a second part dedicated to the analysis of the thesis of Gregory of Rimini and John of Mirecourt, whose knowledge is fundamental to understand Ceffons’ proposal. The two Masters are at odds toward the significabile complexe: while Gregory of Rimini gives to the doctrine its best elaboration (overtaking Adam of Wodeham’s proposal concerning the ontological status of the significabile complexe), Mirecourt attacks the doctrine, denying the validity of the infinitive clause (which founds the structure of any complexe significabile) and criticizing the consistence of the proposition’s total significate, trying to get back to a more usual propositional-truth context. In this essay the author aims to reflect on the principle of sufficient reason in the thought of Christian Wolff. It will highlight the ‘protologic’ dimension of the principle, which is rooted in Wolffian entire philosophical system: if it is true that the principle of sufficient reason runs through the cognitive and ontological field, the ‘reason’ of his certainty is situated in a common psychological experience to all sentient individuals , which is a central aspect to better frame Wolffian rationalism. In order to define this perspective, the author follows a backward iter, comparing what Wolff argues in the Ontology with key steps of the German Metaphysics, up to give an account of the criticisms of the pietists to Wolffian definition of this principle, as well as of Wolff’s defense, as they emerge in the early polemical writings. Bernard Bolzano is doubtless one of the leading and multifaceted figures of Austrian philosophy in the 19th century. His achievements and contributions not only to philosophy proper but also to many other scientific and academic disciplines have been influential until today. In the last five decades the particular interest in his mathematical and logical thoughts has grown and Bolzano researchers estimate his main contribution to science and philosophy in his innovative Wissenschaftslehre. Yet according to Bolzano, the constituent disciplines of scientific philosophy are not only mathematics and logic but also metaphysics, ethics and theology. In this article I explain, beyond the logical-mathematical contributions, Bolzano’s metaphysical intentions in order to show that mathematics with logic can be understood in a more complex and deeper way with metaphysics. As an example of this interaction, I analyze Bolzano’s argument for the immortality of the soul and its connection with some logical-mathematical theories, such as the theory of infinity. In the thought of Simone Weil «the proper method of philosophy consists in clearly conceiving the insoluble problems in all their insolubility and then in simply contemplating them, fixedly». About these issues, to which we must think without ceasing, Simone Weil underlines the one of the radical distance within necessity and good: within necessary and transcendence order. Simone Weil underlines the irreducibility of distance within necessary and good, but at the same time she seems to indicate the possibility or prospective of a thought capable to go beyond the simple acknowledge of opposition. How is that possible? At this level, the weilien thought is compared to a concept which is, at the same time, Aristotelian-Thomistic and tied to Neo-pythagorean philosophy. This is the concept of «convenience». The essay focuses on the relationship between the hermeneutic of religions in the original perspective of Mircea Eliade’s works, and the way by which Julien Ries, a disciple of Eliade, employees and values some essential aspects of Eliade’s point of view. More particularly, I clarify three important elements that in both perspectives play an important role, in order to highlight the experience of homo religiosus. These elements are symbol, myth and rite, considered as universal elements of the structure of human constitution. The main question of the essay will be: how does Ries display Eliade’s research? As a result of the study, I expect a first comprehension of the scientific relationship between the two scholars. The work aims to restore the author Alessandro Manzoni to the history of linguistic thought, presenting for the first time both the Italian translation of Manzoni’s French footnotes in the Port-Royal Grammar, and the proximity of the footnotes to the excerpts from Della lingua italiana, where the new version may be understood from a broader theoretical discourse. Manzoni’s criticisms of the Port-Royalists’ inflexible norms are not only restricted to the area of abstractions, but they also make themselves explicit in very detailed linguistic examples. These include the semantic value of the verb, the use of de/des particles and the underlying ellipses, from the discovery of an error made by the compilers of the Grammar, to the refutation of analogical reasoning as an exclusive effective cause of language in favour of linguistic use. The research does not aim to propose an ingenuous and unhistorical interpretation of the theoretical reflections of Manzoni, but demonstrate the long and authoritative diachronic processing of some of the linguistico-theoretical issues that have become crucial in the current context.